. Published on Wednesday, August 8, 2018 . In honor of National Pet Week, which ran from May 6 to 12, Associated Students Inc. (ASI) Student Activities and Programs (SAP) decided to bring the animal-loving celebration to the Cal Poly Pomona (CPP) campus by hosting its very first Festival of Animals. Festivities kicked off on Tuesday, May 8 with a special lecture from our very own College of Education and Integrative Studies (CEIS) professor Aubrey H. Fine, who has been a pioneer in conceptualizing the value and health benefits of the human-animal bond. The lecture, which took place at the Bronco Student Center (BSC), Lyra (Bldg. 35-1611) was jam-packed with students who were eager to learn more about the undeniable connection between animals and humans. Fine began his lecture by discussing the power and benefits of animal-therapy, and how the field has grown immensely over the decades. Fine also shared how his never-ending curiosity about the human-animal bond is the fuel that has ignited his career throughout the years. Fine, who had been part of the CEIS faculty since 1981 and retired at the end of the 2017-18 school year, revealed that this was the first time he had given his moving and captivating animal-bond lecture outside of his own classroom. Fine even shared his fondest memory here at CPP about the relationship he established with Amber, a horse at the W.K. Kellogg Arabian Horse Center. 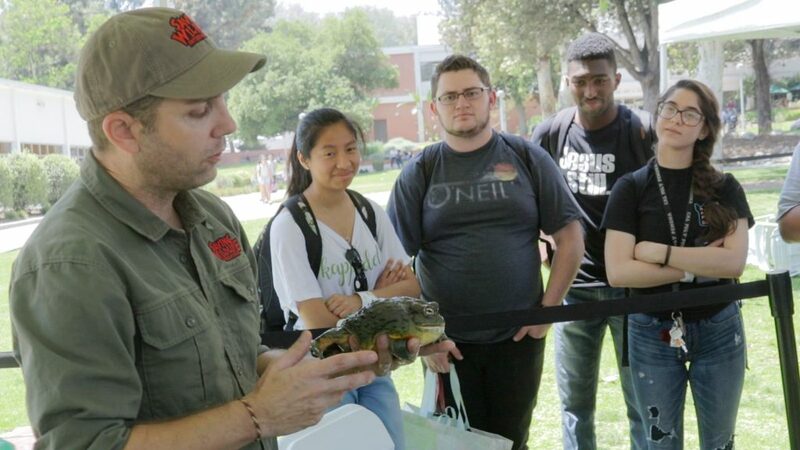 “What’s really nice about Cal Poly Pomona is this notion that we see the power of the human-animal connection and why that’s relevant,” said Fine. “Understanding its relevance is what I hope the people walked away with.” By the end of the lecture, it was apparent that Fine’s teaching legacy will live on in the human and animal bonds he created at CPP throughout the decades. In addition to Fine’s special lecture, SAP was determined to expose students to unique animals they might not normally see up close and personal, which is why they decided to host a two-hour animal interaction on Thursday, May 10 at University Quad to finish off the festivities. To handle or touch the animals, students were first asked to sign a waiver to ensure the safety of everyone. But those who simply wanted to watch and learn from sidelines were able to immediately stop by the booths and chat with the representatives from the Mobile Zoo of Southern California, Saving Wildlife International and Wildlife Learning Center about the animals. Some animal guests included a two-toed sloth, armadillo, large python, macaw, umbrella cockatoo and red golden pheasant. In addition to the animal non-profits, CPP’s very own Vivarium was also part of the festival, which featured a rosy boa, uromastyx lizard, gopher snake, chameleon, desert tortoise and a crested gecko at the booth. Manuela Edwards, a fourth-year environmental biology student who works at CPP’s BioTrek and Vivarium, was excited to share her experience of working on campus and the learn-by-doing opportunities this program provides students. The festival also hosted the Pomona Police Department, who brought out their police dogs to demonstrate the various training techniques they use, which drew crowds of students to University Quad. While the festival of animals mainly consisted of animal demonstrations and interactions, students were also able to walk along University Quad to visit various vendor booths to get balloon animals, face and body paintings, origami, comics, succulents and caricature drawings. To keep up with future ASI events, be sure to follow us on Facebook, Twitter, Instagram or Snapchat @asicpp.